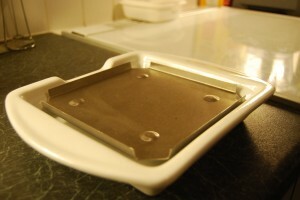 Fuelled by recent bloggery and yesterday evening’s delicious steaks, I want to tell you all about my steak stones. I was first introduced to the concept of cooking my own steak at the dining table by a visit to the Pistenklause on my first trip to the Nürburgring. Essentially you get served chips, sauces and general sides as usual, and your steak arrives raw on a sodding hot stone. That way you get to cut it up and cook it on the stone, exactly as you like it. Not only does this add an extra slice of fun to mealtime, from the restaurant’s point of view it also means customers can’t complain their steak has been cooked incorrectly! Now I like steak. Indeed I like having people over for dinner. Yet I fear I’ll cook their steaks incorrectly. So I’ve managed to acquire a set of six hot stones so we can play this fun game at home! 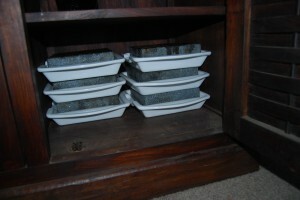 My stones came from Black rock home grill via eBay. 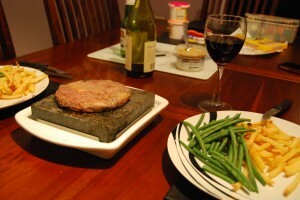 Bizarrely that site doesn’t carry the stones I bought at the moment, but an eBay search for ‘hot stone steak’ does. Be warned: they weren’t cheap at over £200 for six, but they do indeed do the job. Operationally I do struggle to get the stones hot enough. While my (non fan assisted) gas oven will do it on full power if the stones are left on the top shelf for at least an hour, I face a couple of issues. First, I can only fit four stones on the top shelf. So if there are more than four of us eating, some stones aren’t as hot as others. 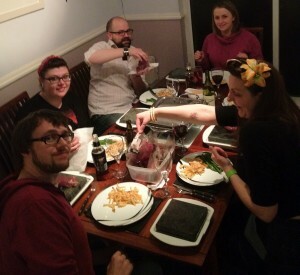 Second, steak should in my view always be accompanied by chips, and the cooking dynamics of my oven seem to change dramatically when there’s a pile of granite on the top shelf. All this said, once I’ve got organised enough to cook a big pile of oven chips and produce some stinking hot stones, this set really does provide a top-notch home dining experience. To add further to the experience, I ordered a bunch of exotic meats from Kezie Foods. That was a fun and tasty evening!